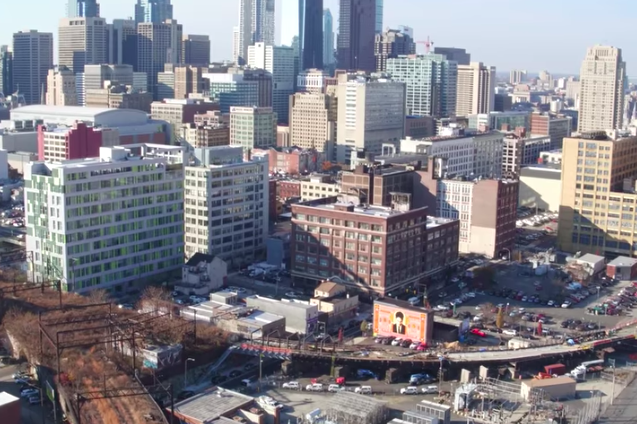 With Philadelphia's skyline in the background, the city's upcoming rail park is shown toward the bottom of a shot captured by Philly By Drone. In October, we told you Philadelphia's elevated rail park was beginning to take shape and would include some cool features once it opens early next year. But an aerial drone video posted this week by the Center City District Foundation provided a glimpse into the park's recent progress. The project's first phase – a $10.3 million effort – includes a 25,000-square-foot stretch of walkway from the northern edge of Center City to Callohill on the old Viaduct railway, built for passenger and freight trains in the 1890s. Most of the steel structure there has been renovated, and new concrete surfaces have been poured and waterproofed. "The swings, benches and walkways are taking shape, the trees are planted, pavers are being installed and work will begin on the 13th Street Bridge," a narrator says over the video. The foundation, which is collaborating on the endeavor with the community-based Friends of the Rail Park and the city, said it has closed the project's funding gap to $180,000. The work began in October 2016. The footage, provided by Philly By Drone, can be viewed below.